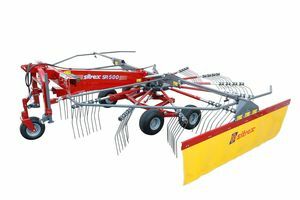 The Sitrex SR Series windrowing rotary rakes are built using the most up-to-date design techniques. From this comes a fast, efficient, strong and extremely versatile machine, which gives excellent results in regard to both quality and in working time. 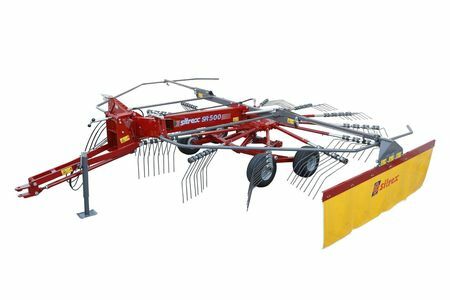 It is possible to set the height of the tines from the ground, level the machine horizontally according to the operating axis, and put the machine in the transport position, all without having to get off the tractor. 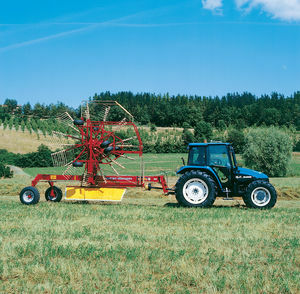 Reduction gearbox, completely encased in oil bath, with specially designed cams, lifts the rake arms in a very smooth, uniform movement and thus the hay is stirred and released gently, avoiding the loss of foliage. 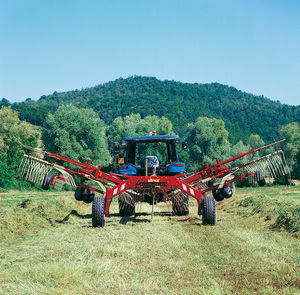 The arms holding the tines have a special shape which prevents deformation and guarantees long life. 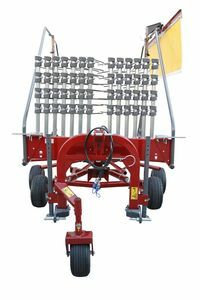 Each arm holds four double tines made from high-quality steel, heat treated for great surface hardness and high impact resistance while working. The tines can be easily removed and replaced. The tandem wheels design allows for a uniform path even on rough terrain. 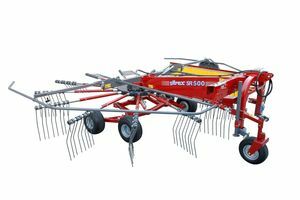 The Sitrex TW Series twin rotary rake with its working width of up to 7.6 m (25') makes it possible to harvest quickly, and thus it is excellent for large farms.The rake is built using the latest designing techniques. The result is an efficient, strong, and extremely versatile machine that gives highly satisfying results, both in terms of quality and working times. 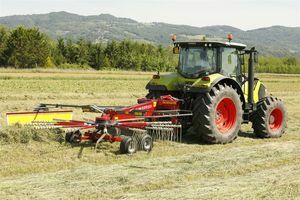 The machine attaches very easily to the tractor and has a lot of clearance in the 3-point hitch area, which allows the cardan shaft to move freely, even in very tight curves. 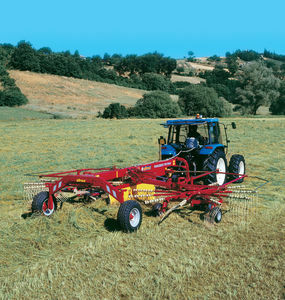 The self-steering frame makes it possible to form compact, uniform windrows, ideal for the harvesting machines. 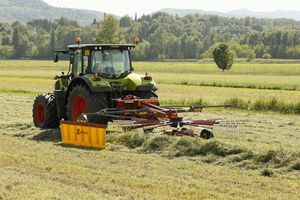 Plus, the fast hydraulic regulating of the windrow width allows immediate adjustment to the characteristics of the machine that follows for harvesting. 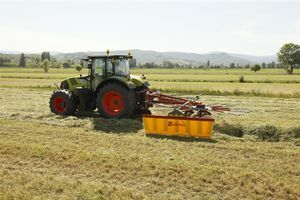 Another fundamentally important aspect is the side rotor units' great adaptability to various types of terrain.This is possible because the side rotor units and their carriages are completely independent from the main frame and free to move with respect to the tractor direction, either longitudinally or transversally. All these features make the TW Series rake a safe, fast, reliable machine.